Everyone's been in a panic over the recent rumblings that planetary alignment shifts might have jostled our current astrological signs but I, for one, have no desire to dump the dozen signs I grew up with to add this Ophiuchus character. After all, I am totally secure in my Scorpio status. What would I do if I suddenly became a Libra?! No way, Jose! Besides, Converse has introduced the Star Power Chuck Taylor All Star Ox, all gussied up with your astrological sign. 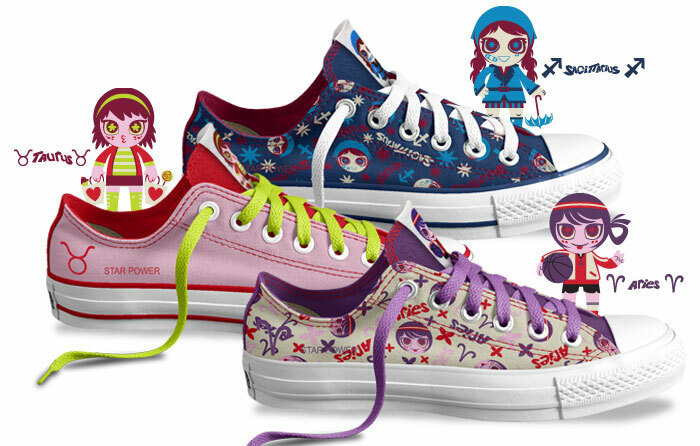 They are the cutest sneakers, ever! I just don't see me in the lavender Libra pair. That little girl is carrying a teapot with hearts on it. There's no way I'm a Libra. I think I need the Scorpio pair, don't you? They are practically screaming my name with the red background and slightly demonic girl carrying an LP. 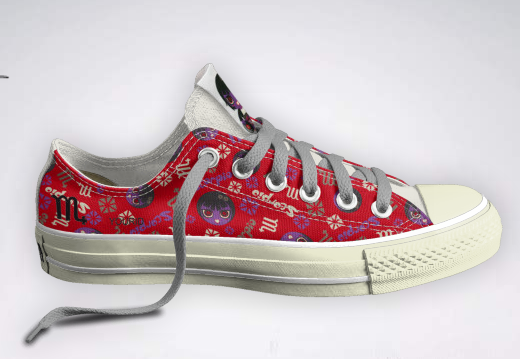 Roo's a Pisces and I think the pink/aqua/lemon palette suits her to a T.
You can customize Star Power Chuck Taylor All Star Ox with solids or prints. Not that I could remotely understand why you wouldn't get the prints, though. Disclosure: I came across these online and thought you should know about them. I was not paid to write about them although if Converse wanted to send me sneakers, I would totally be down with that. Oh those are definitely you! Especially with the LP. You. Must. Get. Them! I think mine (Arie) suits me too. My daughter saw me looking at this she absolutely loves the blue ones (she's 10) but her sign is the Cancer and when we clicked it she was all "Oh cool you can even change the color." Guess I know what she'll be looking for the next time we go shoe shopping.